The foreign-born workforce in the U.S. is growing at a greater rate than the native-born workforce. Even though foreign-born workers represent only 15% of the total labor force, they accounted for 50% of the growth in the labor force from the second quarter of 2005 to the second quarter of 2006. Almost matching the rapid growth in their numbers, foreign-born workers also accounted for a large share (43%) of the increase in employment. The foreign-born population 16 and older was 33.6 million in the second quarter of 2006, an increase of 1 million (3.1%) since the second quarter of 2005 (Table 6). The native-born population 16 and older increased by 1.8 million, to 194.8 million, but that represented an increase of only 0.9%. The growth in the foreign-born labor force was 1.1 million (4.8%) compared to an increase of 1 million (0.8%) in the native-born labor force. Economic outcomes for foreign-born workers also improved. Employment of foreign-born workers increased by 1.2 million (5.5%), from 21.1 million to 22.3 million. By comparison, employment of native-born workers increased by 1.5 million (1.3%). The unemployment rate for foreign-born workers is nearly one percentage point lower than for native-born workers (3.8% vs. 4.7%). Foreign-born workers also have higher employment rates and labor force participation rates. Their employment rate increased from 64.8% to 66.2%, and the labor force participation rate increased from 67.8% to 68.9% in 2005-06. However, those two economic indicators were virtually unchanged for native-born workers. The 2005-06 period sustained the recent trend for foreign-born workers. The Bureau of Labor Statistics reported that foreign-born workers accounted for about one-third of the increase in employment in the U.S. economy from 2004 to 2005 (U.S. Department of Labor, 2006). The BLS also estimated that the unemployment rate for foreign-born workers fell below that of native-born workers in 2005. In the foreign-born workforce, there are two distinct racial and ethnic groups, Hispanics and Asians. For both groups, foreign-born workers constitute the majorities of their population 16 and older. For non-Hispanic whites and blacks, the foreign-born workforces are small and their impact is not pronounced. However, among Hispanics and Asians, the growth in the foreign-born population and its employment prospects defined the outcomes for the respective groups. The Latino workforce has more foreign-born workers than native-born workers (Table 7). In the second quarter of 2006, there were 16.1 million foreign-born Hispanics (16 and older), compared with 13.9 million native-born Hispanics. More significantly, the foreign-born workforce is growing at a greater pace than the native-born workforce. The Latino foreign-born population 16 and older increased by 823,000 (5.4%) in comparison with an increase of only 251,000 (1.8%) in the native-born Hispanic population. Much of the growth in the Hispanic foreign-born population is estimated to arise from unauthorized migration (Passel, 2006). Between the second quarters of 2005 and 2006, the Latino foreign-born labor force increased by 761,000, about seven times the growth of the Latino nativeborn workforce (106,000). Keeping pace with demographic trends, employment outcomes for foreign-born Latino workers also appeared better than for the native born. Overall Hispanic employment increased by 993,000, but the vast majority of those jobs, 803,000, or 81%, went to foreign-born Latino workers. For nativeborn Hispanic workers, employment increased by a comparatively modest 190,000. The unemployment rate for foreign-born Hispanic workers declined from 4.6% to 3.9% between 2005 and 2006. By comparison, among native-born Hispanic workers this key economic indicator decreased from 7.2% to 6.2%. And while the labor force participation rate for foreign-born Latino workers increased (71% to 72.1%), it declined among the native born (66.3% to 65.8%). As shown in Table 7, the employment rate for foreign-born Hispanics is not only higher than for native-born Hispanics but it also increased by more. The Asian workforce, even more so than that of Hispanics, is defined by foreign-born workers. The foreign-born Asian population 16 and older outnumbered its native counterpart by nearly three to one in the second quarter of 2006—7.7 million compared with 2.7 million (Table 8). Thus, three-fourths of the Asian working-age population is foreign born. The foreign-born Asian labor force also greatly outnumbers the native-born (5.2 million compared with 1.7 million). The increase in the Asian foreign-born labor force in 2005-06 was 218,000, about three times that of native-born Asians (65,000). However, in percentage terms the growth in the foreign-born and native-born labor forces was similar—4.3% versus 4.1%. For Asians, overall employment increased by 306,000 between the second quarters of 2005 and 2006. Of these new jobs, 251,000, or 82%, went to foreign-born workers. For native-born Asian workers, the increase in employment was a comparatively modest 55,000. Unlike other workers, native-born Asians did not benefit from the jobs recovery. The unemployment rate for foreign-born Asians was only 3.1% in the second quarter of 2006, the lowest among all ethnic and racial groups and down from 3.9% in the second quarter of 2005. By comparison, the unemployment rate for native-born Asians was 4.7% in 2006, up from 4.2% in 2005. Native-born Asians were the only racial and ethnic group of workers for whom the unemployment rate increased in the past year. Also in contrast with economic outcomes for most other groups, the labor force participation rate for native-born Asians decreased by 0.8 percentage points and the employment rate fell by one percentage point. For foreign-born Asians, the labor force participation rate increased from 67% to 68% and the employment rate went up from 64.4% to 65.9%. Immigrants are not a significant presence within the non-Hispanic white or the black populations of working age. Both non-Hispanic whites and blacks in general benefited from the improved economy. While the employment outcomes for the foreign-born workforces of each group differed, the overall trend for both was defined by how the much larger share of native-born workers fared (Table 9). The non-Hispanic white population 16 and older is overwhelmingly native born (151 million versus 7.2 million). The native-born white labor force increased by 793,000 between the second quarters of 2005 and 2006 but the foreign-born white labor force decreased by 13,000. At the same time, employment of native-born whites increased by 1 million while employment among the much smaller foreign-born white workforce increased by 8,000. The unemployment rate for native-born non-Hispanic whites decreased from 4.1% to 3.9%. Among foreign-born non-Hispanic whites, it decreased from 4.2% to 3.7%. The labor force participation rate for non-Hispanic white workers was essentially unchanged between mid-2005 and mid-2006 while it increased moderately among foreign-born non-Hispanic whites (60.1% versus 60.5%). The black population of working age is also overwhelmingly native born (23.5 million native born compared with 2.5 million foreign born). 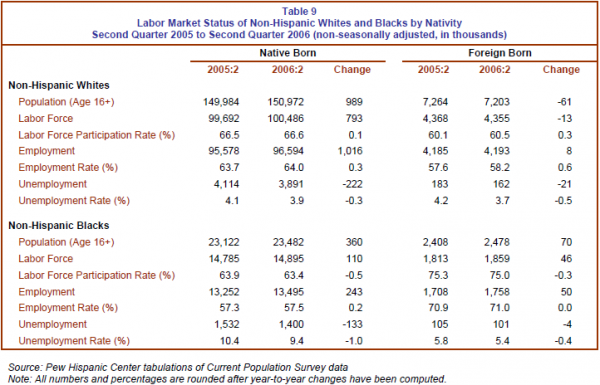 Employment for native-born blacks increased by 243,000 between the second quarters of 2005 and 2006. Among the much smaller population of foreign-born blacks, employment increased by 50,000. The unemployment rate for native-born black workers decreased from 10.4% to 9.4%. However, part of the decline may reflect a drop in the labor force participation rate among blacks (63.9% to 63.4%) because fewer workers seeking work means fewer register as being unemployed. Among foreign-born black workers, the unemployment rate fell from 5.8% to 5.4%, and the labor force participation rate decreased from 75.3% to 75%.